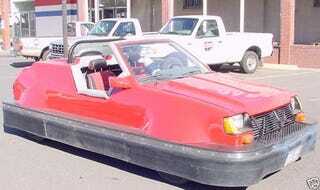 Nice Price Or Crack Pipe: Dodge Colt Turbo Bumper Car For $4500? Ready to cast some Nice Price Or Crack Pipe judgment this morning? 60% of you thought that the $12,500 1973 Ford Ranchero camper was way overpriced, in spite of that 351C/4-speed setup. Today we're going for something a little more affordable, in honor of the onrushing Financiapocalypse. Sometimes you see a car project and you have to wonder what the builder could have been thinking? It's obvious that a lot of thought and quality workmanship went into this '84 Colt Turbo- which even has the extra-hip Twin Stick dual-range transmission- but, well, why? Anyway, the important issue here is price; what do you say? What about the $4,500 price tag on the Dodge Colt Bumper Car?